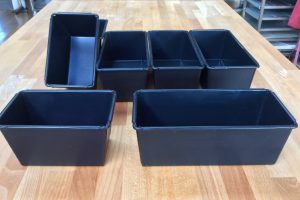 Our bread tins are now sprayed all over with a black anti-corrosion primer and are coated on the inside surfaces with a non-stick material called PFA-235. This gives a very good release of virtually all types of dough, including those enriched with sugary fruits and similar ingredients. Before using a Bread Matters tin for the first time, please wash it in warm water to remove any residual dust or dirt from the manufacturing process. Don’t use washing-up liquid or other detergent. Dry the tin completely. With plain doughs (i.e. doughs with no added enrichment of sugar, egg, fruits, vegetables etc), the tins will not need greasing. Richer and stickier doughs will probably come out perfectly well too. If you do experience any tendency for the dough to stick, use a very thin film of fat or oil just to be on the safe side. Although oils such as sunflower and olive work perfectly well, they inevitably run down the sides of the tin and can leave a bit of a puddle in the bottom which can ‘fry’ the base of the loaf. Fats such as butter or lard that are hard at room temperature avoid this problem in that they can be smeared evenly over the sides and bottom of the tin – and they will stay put until the dough is in the tin. Never use a metal knife or other hard implement to help reluctant loaves out of the tin. If they don’t slide out easily, tap the side of the tin with your (oven-gloved) hand or on a pad (e.g. a folded tea towel) on the table. If this doesn’t work, leave the loaves for a few minutes to ‘sweat’: the residual steam coming out of the loaf will condense on the inside surfaces of the tin and often has the effect of dissolving any sticking points. After baking, if there is any residue of dough left in the tin, wipe it with a damp cloth. If any dough is baked on to the tin, the best approach is to soak the whole tin for an hour or two in warm water; a soft plastic brush should remove the offending material easily. Never use abrasive pads or steel wool on the inner (non-stick) surfaces of the tin. Never stack tins inside each other without putting some paper or cloth between them to prevent the non-stick glaze being scratched. The baskets we sell are made in Germany from compressed wood-pulp. They are designed to hold bread dough while it is proving, i.e. during its final rise before being baked. They are not an alternative to a baking tin. Gently sweep the inside of the basket with a clean soft brush, or with your hand, to remove any loose particles of wood pulp or dust. When your bread dough is ready for shaping and final proof, rub the inside of the basket with flour to help prevent the dough from sticking. If you use wheat flour, wholemeal is marginally better because its bran particles don’t absorb as much moisture from the dough as fine white flour does. Semolina flour (which is made from wheat) is good. Best of all, use brown rice flour which releases better than any gluten-containing flour. Do not use rye flour which is naturally stickier than rice or wheat. Have a bowl of your chosen dusting flour ready. Prepare your dough piece so that the surface that will go into the bottom of the basket is reasonably smooth, i.e. not ragged or folded. Place your dough piece gently into the dusting flour and gently rock it round so that the majority of the surface picks up a fine coating of flour. Then pick the dough piece up by grabbing its top and, without turning it over or upside down, place it carefully into your prepared proving basket. If you pick the dough up by digging your hands underneath it, you risk folding dusting flour into the impressions made by your fingers. Inspect your dough to check that there are no wet-looking areas in contact with the basket. If there are, cover them with a fine layer of dusting flour. 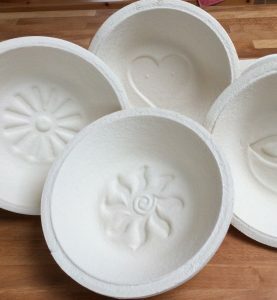 When the dough is fully proved and ready to bake, you need to turn it out of the basket onto a baking tray, baking stone or peel (to slide it on to a hot baking surface like a stone or tile in the oven). Grip the basket with both hands, spreading your fingers across the risen dough. Then, gently but quite quickly, turn the basket upside down, using your fingers to break the ‘fall’ of the dough piece onto the baking tray or peel. Slash the dough quickly with a sharp blade as appropriate and place it in the oven/close the oven door. If the dough gets stuck to the basket, it means that you may not have covered the surface of the basket or the dough with enough flour. Do not lift the basket sharply away from the baking tray, but try to allow gravity to help release the stuck dough. If you can, gently prise the reluctant dough from the basket using deft fingers – rather like removing plaster from sensitive skin, though without most of the pain. Gently shake out any loose flour and allow the basket time to dry. If any residues of dough are left in the basket, it is best to let them dry out, whereupon they can be picked off quite easily with a finger nail. If, over time, there is a general build up of doughy residue, allow the basket to dry out thoroughly and brush it with a stiff but not too abrasive brush, i.e. bristle or polypropylene, not metal. Never stack baskets immediately after use. Allow them to dry out before storing away. A good way to do this is to place them upside down on a wire rack or shelf (or similar) so that air can convect upwards and dry the damp interior. If by any chance, you do notice spots of mould on your basket, dry it thoroughly and brush the mould off as indicated above. Complete sterility and dryness can be assured by putting the baskets in a low oven – not more than 100°C – for about half an hour. In any floury environment there is a risk of flour mites – tiny creeping insects that you may notice on shelves near flour bags, in the flour itself, or in proving baskets. These can be vacuumed away, but the best form of non-chemical control of such insects in baskets is either to freeze the basket (in a poly bag) for 24 hours, or to put it in a low oven as described above. In either case, knock, brush or vacuum out any detritus after freezing/heating. 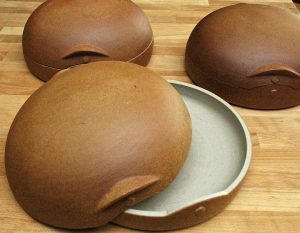 The beautiful bread domes, made by gifted artist Sigrid Hovmand on the island of Samsø in Denmark, took their original shape from an artisan loaf at Skærtoft Mill. Each dome is hand-thrown in stoneware clay, coloured with ochre and turned in one piece before being cut by hand and fired at 1300 C.
Each dome is a work of art, with subtle variations of colour and finish – proof, if it were needed, that these are the products of a true artisan. The lid fits precisely on its base with a simple device to make sure it’s the right way round. The domes are designed to go into an ordinary domestic oven, where it creates the effect of a brick oven, producing a beautiful, rounded loaf with a crisp crust and moist crumb. Most of the baking aromas that normally drift round the kitchen so temptingly are trapped and concentrated in the crust, which tastes remarkably sweet and nutty. Having fermented your dough up to the point where it would normally be put into a tin, you should shape it into a fairly tight cob and place it on the base of the dome which has been greased with a very small amount of olive oil (or similar). Sprinkling some oily seeds, such as sesame or linseed, onto the base of the dome adds a tasty and attractive finish as well as insuring that the baked loaf lifts out smoothly. Replace the lid and allow the bread to rise until it is about two-thirds proved. The time this takes will depend on the type and temperature of the dough. Normally the signs are that the dough has flowed out to the edges of the dome and has begun to rise upwards a little. If you leave it proving for too long, the dough may rise up and touch the dome lid, making it hard to remove to inspect the state of the dough. Put the dome in a cold oven. Turn it to 220°C and bake for 30 minutes. Reduce the temperature to 200°C and continue baking for another 45 minutes. Then remove the lid and, if necessary, bake for a further 5-10 minutes to complete a firm crust. Another way to use the dome is to pre-heat it (with the lid on) in a hot oven for at least 30 minutes. Then turn your proved loaf, e.g. from a proving basket, onto the hot base, replace the lid and return the dome to the oven. Keep the oven at its hottest setting for 10 minutes and then reduce it by 20°C. Baking will probably take 40-50 minutes for a 2 kg dough piece. If using this method, it is easier to bake a smaller amount of dough, say 1-1.5 kg, in the dome. This allows a gap between the dome and the dough and a chance for some moisture to condense on the dough surface, thus developing a particularly crunchy crust. The dome requires little cleaning and using a clean dry brush is normally sufficient to clean it. If there is dough stuck to it, simply soak it in warm water before brushing it out and gently drying. The couche cloth provides a simple way to prove a free-standing loaf and it will please the creative baker who wants to turn out a hand-made baguette or bâtard with a flourish. 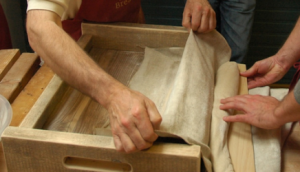 The risen dough is removed from the cloth for baking on a tray or stone or directly on the oven bottom.Traditional French artisan bakeries don’t use bread tins or trays: all their dough is proved on couches (or in cloth-lined baskets known as panetons) and baked on the hearth of their wood-fired ovens. ake sure that the gutters are high enough – you don’t want the dough rising up and touching its neighbour. When all the pieces are in position, push the gutters gently together. How much you do this will determine how thin or broad your loaf will be.The idea is that during proof the dough cannot go sideways because it is pushing against another similar piece, so it goes upwards (and to some extent longways, so don’t start out with your dough stretched right to the edges). When the dough has risen and is ready for the oven, pull one end of the cloth out so that you can flip the dough gently onto a thin floured board (stiff cardboard or thin plywood are good) to transfer it onto the baking tray, peel or pre-heated baking stone that you have prepared. You can ‘slash’ or mark the dough just before you slide it into its final baking place. Authentic blades for this purpose can be found on the Bread Matters website. Bread Matters’ couches are cut from organic loomstate panama cotton. As this fabric has not been treated in any way, it is liable to shrink when washed. The best way to care for your couche cloth is simply to brush off excess flour and hang it up to allow any dampness remaining from contact with the dough to dry out. Then roll it up (rather than fold it) and store it. If you really need to wash it, use cold water and a stiff brush to remove dirt and flour and hang it up to dry. Wash the knife blade immediately after use with warm soapy water and a soft sponge. The handle seldom needs washing but, when it does, just rinse and wipe it, using nothing harsh or abrasive. Dry the knife straight away and store it carefully. These knives should not be left soaking and are not suitable for a dishwasher. Carbon steel (which is not stainless) can be attacked by food acids and it will quickly darken and become blotched. This does not affect its sharpness or effectiveness at all but it is a good idea to clean the blade occasionally with a metal cleaner. To restore its lustre, you can use a metal polish such as the one in the in the knife care kit, which also includes a treatment for the wooden handle. 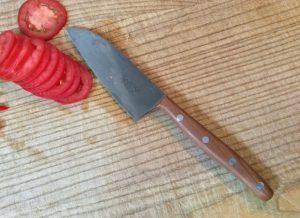 Sharpen your knives regularly, preferably every time you use them. Always chop onto a forgiving surface such as wood (or plastic, if your hygiene practice dictates). Do not use your kitchen knives on glass or granite worktops or cut directly onto crockery such as a plate. These dry-fine ground knives are not suitable for levering or canted cutting. Use your knife only for the purpose it is intended for. Don’t grab it to open a parcel or a pot of paint, dig a burnt offering from the toaster, scrape the roasting pan etc. and never try to chop or slice frozen food with a kitchen knife.